Why Not Play the Bass That Fits You Perfectly? SIZE MATTERS - WHY NOT PLAY THE BASS THAT FITS YOU? Like shirts, basses come in a variety of sizes - they come in small, medium, large, extra large and even extra small and extra extra large. They also come in various string configurations, from standard 4 string to custom 7 strings and beyond. By all means, play what feels most comfortable - play the size that fits you. Medium 4 strings are my size, they simply fit me. I play them - I love them - it's a bit unusual - but I want you to know about them, especially the high end offerings out there. So here we go. What do Paul McCartney (Beatles), Jack Bruce (Cream), Bill Wyman (Rolling Stones), Glenn Cornick (Jethro Tull), Tina Weymouth (Talking Heads), Jonas Hellborg, Stanley Clarke and countless other world class bassists have in common? They all played short scale (30") or medium scale (32") basses during the time period that was arguably the pinnacle of their careers - as opposed to the more conventional long scale (34"). Although played by many very gifted players since the beginning of the rock era, shorter scale basses have become much more in vogue in recent years - even though they sometimes get a bad "rap". "This medium scale bass was designed and crafted by Warwick, in collaboration with Jonas Hellborg. It is in production and has a cool $12,000.00 MSRP price tag". 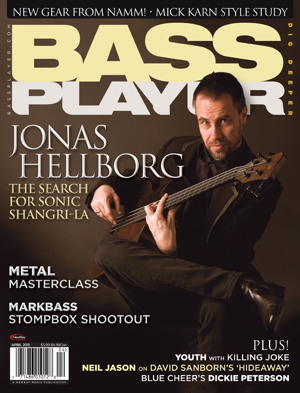 I don't know if you saw the Bass Player magazine with Jonas Hellborg on the cover pictured above, but that high end custom bass - which he designed along with Warwick - is only available in medium scale. MSRP is $12,000.00. Ever wonder about Paul McCartney and the Beatles? Much of their catalog was recorded with a Hofner short scale bass. "Stanley Clarke with one of his custom Alembic "Shorties" start around $10K. Beginner's bass? Student model? Just a toy? Hardly!" 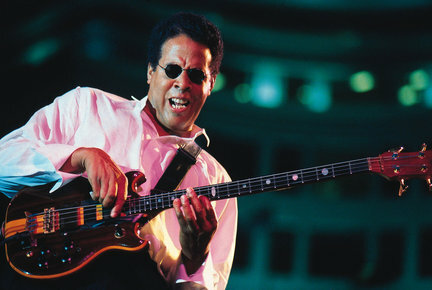 And there are many others, including Stanley Clarke pictured above - even with his huge hands - Stanley simply fell in love with the sound and playability of the shorter scale Alembics - and of course the piccolo basses he is known to play. When luthier to the stars Rick Turner decided to introduce the newest version of his Model One bass in April of 2017, he decided the standard model would be two octaves in medium scale. I prefer the older model below it myself - with no mags - but only a piezo pickup. 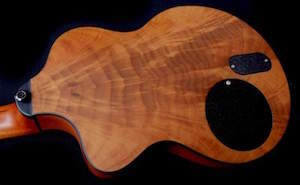 When Brian May of Queen decided to announce the latest – and lowest – addition to the world renowned Brian May Guitars product line, he also went with a ‘medium’ scale instrument, made in the same spirit as Brian’s ‘Old Lady’ 6 string guitar, pictured above. If the short scale - and more scarce medium scale basses - are only "student" models - why do so many world class players prefer them and play them? There are a variety of reasons, but none more compelling than the fact that they rarely sacrifice tone - and at the same time they promote playability. The easier neck reach can equal more playing comfort for many, which can easily translate to more stamina. Unless you have large or extra large hands, the slightly shorter neck - in some cases - allows for faster passages to be played with more finesse, dexterity and aggression - and over time - can easily result in an increase in a player's overall "chops". On a short-scale model, the low end can be much wider and stronger than what’s normally heard from long scale basses. The low end is huge and expansive, aided by the neck’s short scale - which allows the strings to vibrate with less tension. Guitarists realized that the feel of a short-scale bass was more similar to that of a 6-string guitar, making it a viable tool for players who wanted a taste of the low end, but didn’t like the idea of getting used to a longer neck. If you are a good size person with large or extra large hands, the long scale will simply fit you better - you may even need to move to a 35" or 36" scale to feel comfortable in the upper registers. Good for you. But for many of us - short and medium scale basses fit us better - and everyone should be aware of the world-class options that exist out there. 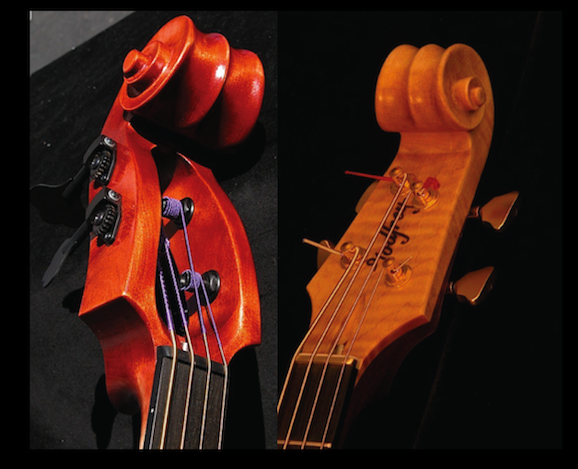 Short and medium scale basses are no longer restricted to "student" or beginner models. Sometimes we have attitudes about it and don't appreciate the inference that anything less than long scale is inferior - especially when there are so many quality options in all scale lengths. In a blind test, I haven't found anyone yet who could listen to a new bass track by an accomplished player - and call out the scale length. From scale length to string gauge, size plays an important part in what you can expect to hear out of your musical instrument. The physical formula for differences in pitch in relation to string gauge and tension is amazingly simple - given equal string tension, there is a one octave drop in pitch when either the scale length or the string gauge (mass) is doubled. While size has a profound affect on the sound of a bass, bigger is not necessarily always better - particularly where string gauge is concerned. An articulate string is one that, given appropriate tension, vibrates freely. The more wraps that are applied to a string and the thicker the core wire used to increase its gauge, the less free the string is to vibrate. The lower you tune the more important free string vibration becomes as any sound your instrument produces has more tonic content than just the fundamental notes being played. There are players that prefer to limit or eliminate overtones, mostly as an attempt to accentuate the fundamental. The easiest, best way to accomplish this is to use a slightly thinner string and reduce tension. Getting more harmonics and overtones is a bit trickier. One way is to increase string gauge which ups tension. The down side to this approach is that increasing gauge decreases string articulation. If the intention is to make more lively a low string this may not be possible. As you can see, it is all about achieving the correct balance between string gauge and tension - with tension relating to the length of the string or the scale length. After cutting my teeth on a number of short scalers, I decided to purchase a brand new 1972 Fender Jazz bass when I was in the Army, stationed overseas in Germany. The PX had a pretty nice deal, and as a GI you could buy Fender products just above cost. I never felt comfortable on the full scale necks, but I figured it was a good time for me to woodshed and see if I could get comfortable on one. I looked at the Fender catalog at the PX and picked out a natural swamp ash Jazz Bass with black blocks. It took about two months to get the bass and when I did I realized that there were a number of dead notes on the neck, on the G string from frets 4 to 7 and the same on the D string. Frets 5 and 6 were horrible with immediate drop offs when you plucked the notes. Frets 4 and 7 were a little better but still didn't sustain for even a full second. I began to wonder if Fender was sending the "seconds" to the GI's overseas, and maybe they were. I had never heard of the "dead spot" phenomenon - none of my previous short scale basses had any. When I got back to the US with the bass, we were learning a piece from a rock opera - eventually called "Open Book". It was a mellow piece in an odd time signature and it called for whole notes that would sustain for a 4-count. I couldn't begin to play the part on the Jazz bass - the notes I needed to sustain were the dead ones. I borrowed my singer's Rickenbacker 4001 and never looked back. I sold the Jazz and eventually bought my own mapleglo Rickenbacker, which by the way was 33.25" scale, a full 3/4" shorter scale than the Jazz Bass. I was immediately more comfortable. In the early days of the Fender Bass, many of the pioneers of the instrument were looking to emulate the sound of the upright bass. The way they did it was to use the comparatively muted flat wound strings and to use a foam mute under the bridge. The early ashtray bridge covers had strips of foam on top of the strings designed to deaden them, but many players wanted even more "mute" on the strings - so they would tape sponges or other pieces of foam next to the bridge under the strings. In those days, sustain was not even close to being an issue. They wanted thump not sustain. To be fair, many of today's players are in a similar situation. The genre or repertoire of music they play doesn't call for much in the way of bass sustain. In those days - and even today - many players don't notice or care that their basses have dead spots, they just play right through them, but for anyone who plays ballads and needs the occasional 4-count sustain, dead spots can definitely be a problem. "Bolt-on 34" scale electric basses seem to be the most prone to dead spots. Dead spots are caused when a standing wave is created in the neck at a certain resonant frequency. This issue is usually blamed on the instrument having a bolt-on wooden neck but the issue has also shown up in neck through basses and on graphite necks. They are far from being exclusively a Fender issue as it happens in all brands and in all price ranges. It seems to almost never happen on a short scale bass. As was mentioned, you will often find a dead spot living around the fifth fret of the first string on a 34" scale electric bass, but they can happen anywhere in playing range. It depends on the resonant frequency of the neck." The interesting thing to me - is that dead spots- at least to some degree - appear to be a by-product of scale length. None of my sixteen basses are standard 34" long scale and guess what - no discernable dead spots anywhere. Did I simply get lucky 16 times in a row? I don't think so, in all my years on the bass forums I have yet to find a medium scale bass owner who has found a dead spot. From my experience, I have a little test I perform when considering the purchase of a bass - although with the non-standard scales I buy, the subject is close to moot. I pluck each note on the fret board individually, starting on the G string, and use a four count at a ballad tempo. If all the notes hold at least a four count, I am good to go. There may be other issues related to dead spots, but none of them bother me. I just need to make sure I have a four count sustain on each and every note. I say, abandon your bass if the dead spots are unsolvable, and find a bass that has none. I do hear of long scale Fender players who claim they don't have any serious dead spots. Obviously Leo Fender didn't get ALL the details quite right. I find it interesting that many of the long scalers with dead spots have a very common attitude, and love to perpetuate the myth: "All stringed instruments have dead spots to some extent." I always have to chuckle - nothing could be farther from the truth - as any experienced medium or short scaler would be happy to tell you. For those of you with this unfortunate problem, I have posted a number of articles and suggestions on how to solve the problem here. Don't get overly excited - I had four of the finest luthiers in the Washington DC/Northern Virginia area try to fix the dead spots in my Jazz Bass and none of them ever could. We tried everything under the sun. I made a trip to Germany last October to spend a few days with Luthier extraordinaire Jens Ritter, and that trip started me on a quest - to build the bass that not only fits me perfectly, but is light in weight and so well-balanced that it hangs on me in the exact playing position - whether sitting or standing. No need to use a special suede backed or funky waist-band strap, or some silly jury-rigged extended strap button or other “invention” in order to achieve this simple goal. Really? We have to move into the world of the unorthodox in order to own a bass that hangs properly and fits us correctly? I mean, don’t bass builders take weight and balance into account when building their basses? I think bass players deserve better than neck dive. We have the right to be much more demanding about the long-term health implications of the instruments we play. We should never settle for an instrument that isn’t light and perfectly balanced. If you want to be playing well into your twilight years, you need every advantage you can find with respect to repetitive stress health issues. We all deserve better. Neck dive and excess weight add to repetitive stress issues, especially if you are like me and you log tons of playing hours over decades. It’s really that simple. Neck dive has become a dirty little secret here on TB that seems to get swept under the rug far too much of the time. I mean, does anyone own a full scale 34” - 35” bass that doesn’t dive at least to some degree when sitting or standing? Do yourself a favor, take your strap off and see if the bass dives when sitting down. It shouldn’t, but many do. Players always console themselves with the rationalization - “I never take my strap off while sitting so it’s a non-issue.” I got news for you, it is an issue. Your body is likely expending precious energy in one form or another in order to hold that neck up. Your shoulder still absorbs the impact. I see denials all the time, but I still wonder. Basses with extended necks and extended ranges, 5-6-7 strings can be way heavy too. I chuckle every time I see a player with one of these huge heavy basses - especially when he is actually sitting down on stage. Is that really what it has come to? I want light, balanced and streamlined. I want a bass that energizes me and inspires me to be all over the stage. Some folks looks like they are wrestling an aligator when they play. I don’t want no albatross around my neck. Jens told me that he routinely works with physical therapists and chiropractors in Germany to be sure his basses hang on you in the perfect playing position. That also explains the radical body shapes and designs. It’s about creating balance. Admittedly, I am not a fan of most of the Jens body shapes. Body shapes and our reaction to them is ultimately highly personal. That is why some of us like blonds, some like redheads and some adore brunettes. One person’s jewel is another person’s yawn. I have resigned myself to being a fuddy-duddy, an old schooler, who realizes that bass body shapes are way too important to me. After spending considerable time at his shop, I realize that the current Ritter bass offerings are not for me. Call me conventional or even closed-minded, but I gravitate more to symmetry when it comes to body shapes. I played a medium scaler he had in the shop and I think he was a little offended that I didn’t spend much time with it. Now that the Princess Isabella bass is a reality - if he would make one for me in medium scale and make it double cutaway - we might have a deal. I love Jens, he is a genius, a craftsman, a true artiste and one amazing gentleman. I am hoping one day that we can work on an instrument together. “Anyone who’s played a lot of bass has experienced the bizarre spectrum of pain, discomfort, and general physical weirdness that’s an inescapable consequence of the repetitive motions our instrument demands. My struggles, while disconcerting, have never been too severe—just the occasional jolt of a pinched nerve or the muscle soreness that hours of fine finger movement entails. Others aren’t so lucky, though. Carpal tunnel syndrome, severe back pain, and a spectrum of debilitating repetitive stress injuries have even forced a few friends to quit. The Artisan Bass Works (ABW) True-Tone reviewed here is the result of a multi-year R&D process aimed at designing a bass that addresses some of the instrument’s ergonomic shortcomings, specifically the tendency for us to use our fretting hand to counter-balance neck dive, thus wasting energy and increasing joint and muscular stress. This also frees up the fretting hand to do just that: fret...On most basses, the body and neck lie along similar horizontal planes. The ABW, however, orients the neck at a 42-degree angle relative to the body.. "
So this all sounds very promising to me, wow - I thought - a company is finally addressing this long overdue issue. But as I read along, I bump into this: "With a bass like this, it’s all about the playability. As promised, the ABW does put the neck in a more natural playing position than on a standard bass. In the sitting position it isn’t as noticeable—the neck dove a bit—but on a strap, the ABW design comes into its own. So let me get this straight, the purpose was to design a bass that hangs perfectly on you and doesn’t dive - but when you are sitting down without a strap it still dives? Sounds to me like they may want to hit that old drawing board again. “It won’t be for everybody, but for folks who find standard bass design leading to nagging discomfort, the True-Tone could be a salvation.” Weighing in at nearly 10 lbs. 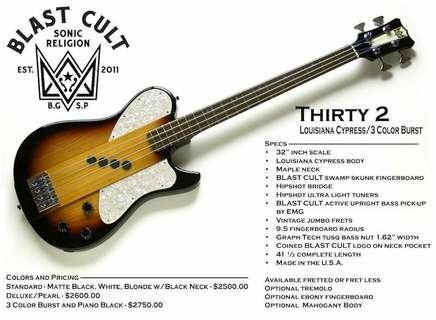 I really don’t think this particular bass is going to solve many ergonomic or repetitive stress issues - or be anyone’s “salvation” - but hey - to each their own. What do I know? There certainly seems to already be a number of dedicated fans out there who swear by these instruments. In my view, if you have to use a waist strap or other custom strap invention to be able to cope with instrument weight or lack of balance, you should be shopping around for a new bass. My heaviest bass tips in at 9.8 lbs but most of mine are less than 8 lbs. No offense intended to our extended range brethren but how many times have you seen them or photos of them at a gig where they literally have to sit down - or they look at least a little ridiculous with those massive basses strapped on. They might sound fine, and I admire them for their adventurous spirit and their desire to be the trail blazers - but it is still a work in progress. I have picked up more than a few extended range basses and given them a spin. So far it hasn't struck a chord with me, but that doesn't mean it won't. It's rare to find an up-and-coming player on a six and seven string bass, who is able to properly honor the foundation - while still adding tasteful melodic elements, which actually justify the use of those extra strings. Those extra strings can be a real distraction and temptation but all is good if you can continue to honor the foundation of the groove. Additionally, how many players do you see who are leaning ever so slightly - in order to balance the bass and put it into proper playing position when standing. Their torso and spine is tilted a tiny bit which wreaks havoc on the torso, shoulders and spine - and over many years of playing will only increase your exposure to repetitive stress injuries. The bass you spend thousands of hours playing should be properly balanced if you intend to preserve your health over the long run. On the technical side - the scale length on a bass guitar is measured as the vibrating portion of the string - from the nut to the bridge - although scale length can also be measured - perhaps more accurately - as the distance from the nut to the twelfth fret and then doubled. Here is an example of three different scale lengths, using actual photographs of the 1962 Jazz Bass replicas sold by Fender Japan. There is a short scale (30") bass - which is superimposed over a medium scale (32") bass - which is superimposed over a full scale (34") bass. You can see that playing a Fender short scale bass resembles playing a long scale with a capo on the second fret. The medium scale Jazz is like putting a capo on the first fret of a long scale. Remember. the bodies are slightly smaller - so that on the shorter scales, the bridges are also moved closer to the neck - which makes the fingerboard only about one inch shorter in each case. Many folks erroneously believe that a medium scale bass neck at 32" scale is a full two inches shorter than a 34" scale neck - and as you can clearly see this isn't the case. When moving from a long scale to a similar model medium scale bass - the difference in tone and string feel is negligible - as is the "floppiness" some report. I don't use medium scale strings on my medium scale basses. I have always used standard long scale strings - and if tension or "floppiness" is an issue, I simply move up to a slightly heavier gauge string. However, I find that tension is rarely if ever an issue with any of my instruments. I find it to be a very subtle difference going from long to medium scale. A good percentage of the tone lies within the windings of the strings - and I spend a lot of time deciphering and testing the subtle differences from brand to brand. When I mention the low end improvement a medium scale provides - the full scale players roll their doubting eyes. Problem is - they very rarely speak from experience - as they don't have access to matching brand and model basses - in both medium and long scales - to run a proper A-B comparison test. With some shorter scale production basses, choosing the right string type and gauge - and completing a proper set-up - will allow players to more than compete one-on-one with the tone of their long scale brethren. One of the biggest complaints heard from long scale players trying out a short scale - is that the strings feel too "floppy". If the strings are too floppy go to D'Addario and download the String Tension Chart. It's easy - just figure out what tension you are pulling on your long scale - and use that tension to determine the correct gauge for pulling equal tension on the short scale. Unfortunately, very few of the major bass string manufacturers publish their tension charts. This is one of my pet peeves and it makes it more than difficult at times. If you stay with D'Addario, this can work and you know that the strings for the short scale will more often be a slightly heavier gauge. It will not be any more floppy than what you are used to on the long scale. Believing that the short scale bass is inferior because of floppy strings is simply a myth - spoken loudest by the truly uneducated. With the right gauges they will have the exact same feel as your long scale - and you should realize a nice increase in fat low end. Always remember, when changing string brands and gauges a proper set-up - including a truss rod tweak - may be required to get the action where you like it, and you will more than likely need to adjust the intonation as well. One of my favorite stories along the way was when I arrived at Keith Roscoe's shop in September of 1999 to pick up the first medium scale bass he had ever built, pictured above. As I walked in he was unplugging the bass from his amp and he had kind of a puzzled look on his face. After we exchanged pleasantries, I asked him if everything was alright with the bass and he said: "You know Rick, after everything I have heard over the years about the performance of anything less than long scale, I gotta tell you - this bass sounds as good as any bass I have ever built." Keith was more than right - the Roscoe basses have amazing tone, sustain and playability in medium scale - and have proven to be lifesavers for me. Keith measured the PRS neck precisely and duplicated the shape exactly. After playing my medium scale PRS exclusively for over 20 years, the Roscoe basses did not disappoint and immediately felt like old friends. For more on the building of this bass click here. For examples and photos of my collection, please click on the gallery section of this web site and if you made it this far - thanks for listening. I don't think anyone in the know would argue with the fact that Fender was the true pioneer in the creation of the first high quality bass guitar. 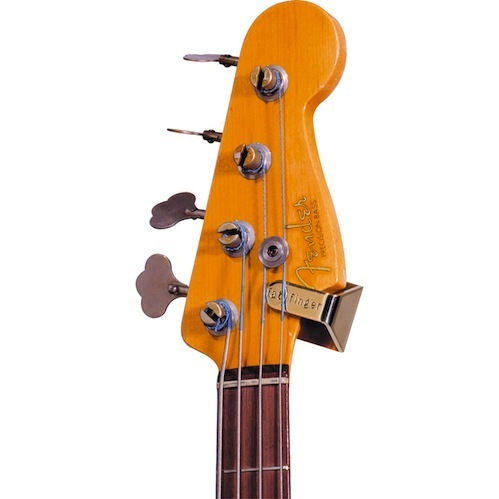 Leo Fender nailed it on the first go round with the Precision Bass in 1951 and certainly added to his legacy with his subsequent introduction of the Jazz Bass. For my nickel, I wish the original Fender designs would have been medium scale. My medium scale Fender Basses do not have dead spots in the neck or exhibit the kind of neck dive the full scale models do. For these reasons alone, I sometimes wonder if Leo Fender really did get it right? Perhaps he should have settled on medium scale as the standard, to avoid the dead spots. But, scale length aside - with a variety of tweaks, modifications and innovations over the years - Fender has continued to set the bar high. They became the industry standard, and even today skilled luthiers use the Fender Precision and Jazz basses as a yardstick to measure the sound and quality of their basses against. "Is there a tonal difference? Yes, definitely. For one thing, short scale basses sometimes use a heavier string gauge than their long scale brothers, which imparts a thicker and more bass-heavy tone than lighter strings with more brightness and snap. Further, shorter scale strings require lower string tension for proper intonation, which imparts not only a looser, "more floppy" feel to the strings, but also results in fatter sounding low notes." "Many studio pros know the secret of how unique short scale basses sound. The lower string tension provided by the short scale has several benefits - easy playability, sweet upper register tones and fat blooming low end, not to mention the added nuance that comes naturally when playing this type of bass. The lower string tension means less attack, but more “bloom” on the end of the note. The lower string tension also produces a slightly fuller low end. To demonstrate this, detune a string one whole step on any bass and hear the tone thicken as the string tension is dropped." Hmmmmm, fatter sounding low notes? Fuller low end? Sign me up! For me, medium scale is a perfect fit - it is like coming home, but if you don't have it custom built, or search diligently to find one - you may rarely see any popping up. 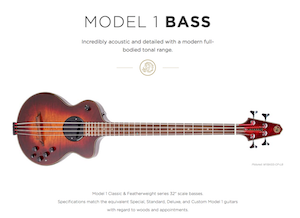 There are only a handful of medium scale production basses coming off the line, but there does seem to be a bit of a trend of late to offer more models. As much as I find the long scales too long, I generally find the short scales too cramped in the upper registers. 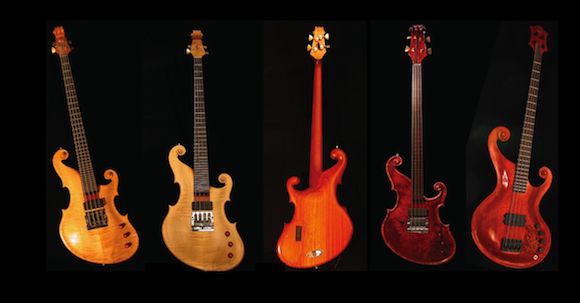 Some of the "off the rack" short scale production basses are shown from left to right below - Unfortunately, some of these are still referred to as "student models". As pictured below, Gretsch has their short scale Electrotone and ThunderJet models - along with a JuniorJet and a Billy-Bo Thunderbird bass. Gibson has released a Les Paul Junior and an SG Faded short scale. Fender has recently released short scale Squier versions of it's Jaguar, Bronco and Mustang models to go along with the Fender Mustang, Bronco and Music Master models. 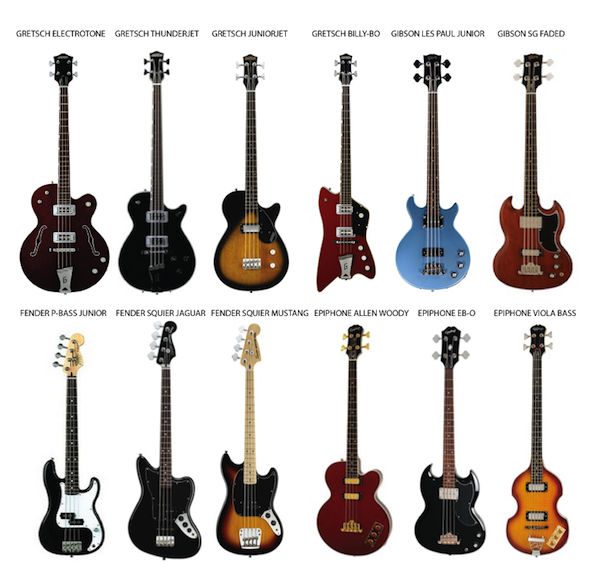 Gibson's Epiphone division has an Allen Woody semi-hollow RumbleKat, an EB-0 and a Hofner type knock-off Viola Bass. Not pictured below, Gibson has released a short scale version of the popular Thunderbird bass here - while Fender Japan has released - along with their full and medium scalers - a short scale version of their iconic 1962 Jazz Bass replica here. There was also a Fender U.S. Precision Bass Junior - with an extra short 28.5" scale - but it has been discontinued. 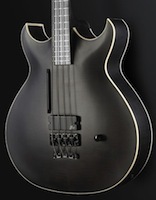 Other manufacturers in modern times such as Ibanez, Yamaha, Guild, Kubicki, Aria, SX (Essex), Hamer, Dean, Cort, Warwick, C.B. Basses, S.D. 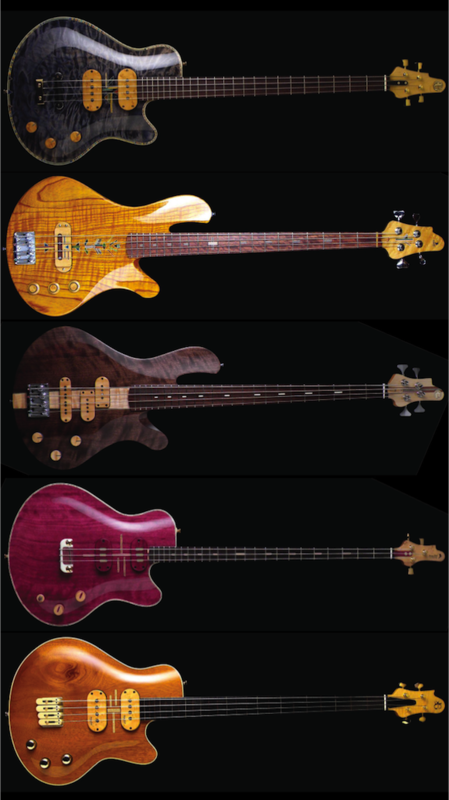 Curlee, Alembic, Birdsong, and others - have offered some short scale basses - and even the occasional medium scale model over the years. Forgive me if I have left any out and if you are a provider of short and/or medium scale models. Drop me a line here with a link and I will be happy to add you. Medium scale basses are around, but you really have to do your homework to find them. Fifteen of the sixteen basses you see in the gallery on this site are medium scale. Only the Rob Allen "Mouse" is short scale. It is easy to do a search on Ebay for "Fender Bass Medium Scale 32". 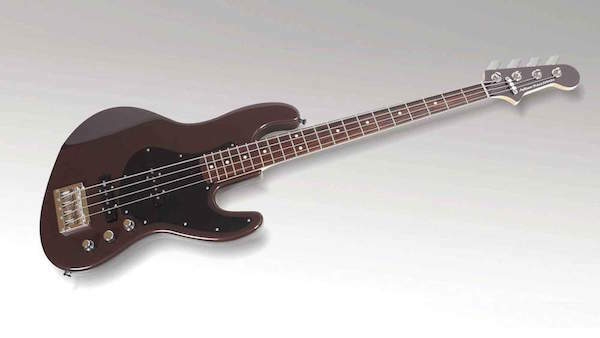 Unfortunately, many of the Fender medium scale basses come from Japan. In this case, you don't have the luxury of examining or playing the instrument in advance of purchase. I find that most Japanese dealers go out of the way to provide an incredible amount of photos. I have purchased many basses in this way, sometimes they have provided in excess of 100 photos. I have only had one problem over the years with a dealer - on a bass made in 1986. This situation involved a hairline crack in the neck for about two inches where the skunk stripe met the maple. I took it to my repair man and he was able to glue and clamp the neck, and then refinished the neck in satin for me - making the neck even better than new. I informed the seller and he promptly reimbursed me the $150 I spent to fix the crack. In this case the hairline crack was almost impossible to see on the photos, but after I mentioned it to him - he was able to go back to his photos and verify it. Their reputation on Ebay means everything to them - and I find that they will go out of their way to make certain you are happy. The workmanship is pretty darn good. I re-imagined this bass and I am also using an identical neck from this bass to create a 1954 Precision Bass. To see what the Tele bass turned into click here or click here to see my 1954 P bass project. Sometimes, you have to be creative when it comes to medium scale basses. There simply aren't many models to choose from and if you can't find what you want, have what you want built or assemble your own. One of the most interesting features of these projects is that the old school necks have no fingerboards - and the frets are installed right into the neck. 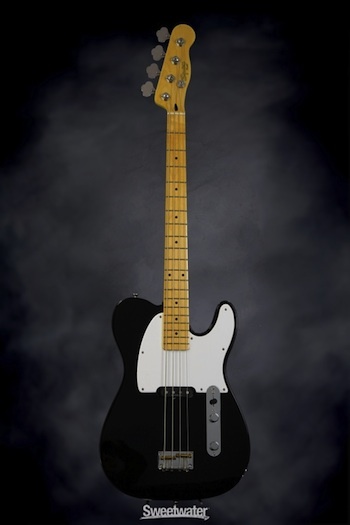 The Tele bass plays amazingly, has a Seymour Duncan designed original P Bass style pickup, and a three position tone switch. For $299. there are no excuses for anyone not to check out what a dream this 32" medium scale neck is. All of the necks from the 1980's Fender and Squier Japan medium scale basses are interchangeable between P and J models - to include the new Jazz bass which is still being manufactured by Fender Japan. Those necks are profiled proportionately like the full scales - with the J neck narrower (39mm) at the nut than the P necks (42mm) - and the P necks have a little more meat on them accordingly. Those necks are approximately 2.25" wide at the pocket end of the neck. The neck on the Tele bass shown above, is an interesting statement by Fender. The neck width at the top of the pocket is close to 2 3/8" (62mm) or only 1/8" narrower than the standard Fender full scale neck. Another exception is a fairly new medium scale offering from Fender, called the Pawn Shop Modified Jaguar bass. 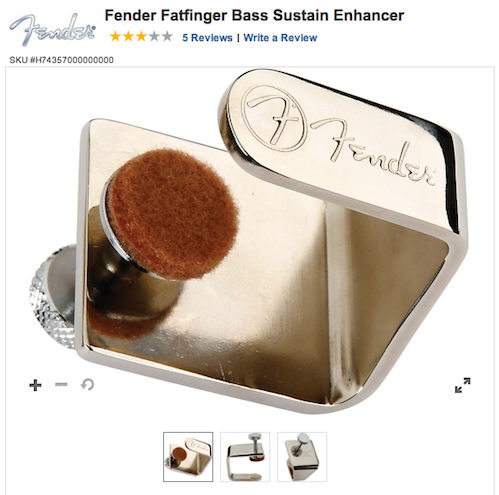 Oddly, Fender reversed both the body and the head stock so that the tuning pegs and body point are on the opposite side - which makes the bass a little difficult to tune. To me, it is really what amounts to a left handed neck on a right handed bass. It's pretty screwy as below. Looks like they had a bunch of Jaguar body blanks leftover in the warehouse, flipped the body and relocated the electronics and made a bunch of left handed medium scale necks. Before the Tele bass above was released, I asked my friends at Sweetwater to talk to Fender about the possibility of obtaining a "lefty" model of this exact $799 bass, which would give me a right handed medium scale neck. The price came back from Fender in excess of $9000.00 for one - as somewhere along the way it got labeled a "Custom Shop" project. 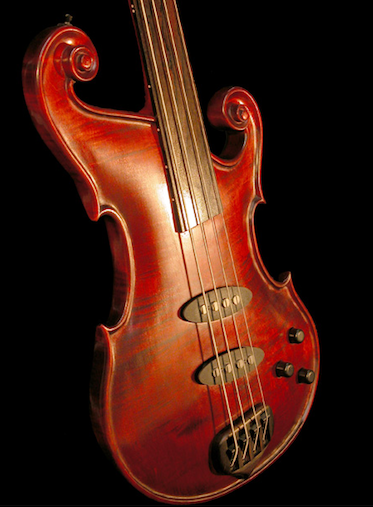 I really like some of the features of the Dragonetti basses, available in medium scale, made by luthier Les Godfrey. It's a shame, he doesn't have one bass that has all of the features I would want - and when we tried to agree on an instrument we were oil and water and the sparks flew. So it goes sometimes. 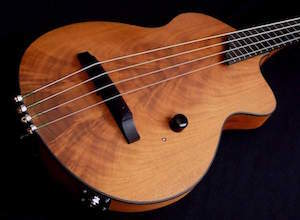 An amazing team of Japanese Luthiers are cranking out a number of really nice looking instruments as below. 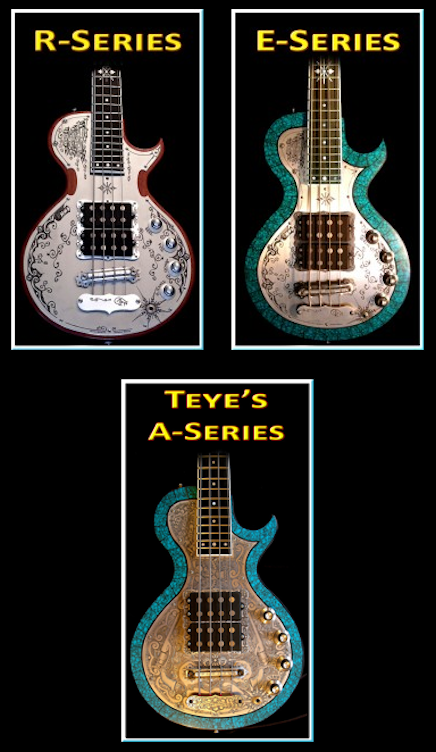 They call themselves Jersey Girl Guitars, and it looks to me like they offer guitars and basses and even double necks and specialty instruments in whatever scale you prefer. Beautiful stuff here. OK, they cut their teeth building rockin' uprights, but here comes the "Thirty 2" - haven't heard or played one yet, but you have to love a bass named after its scale length and wow, don't those individual EMG Pickups look sharp? Company founded by noted California bass maker Jason Burns. Burns builds his basses to withstand the rigors of touring. 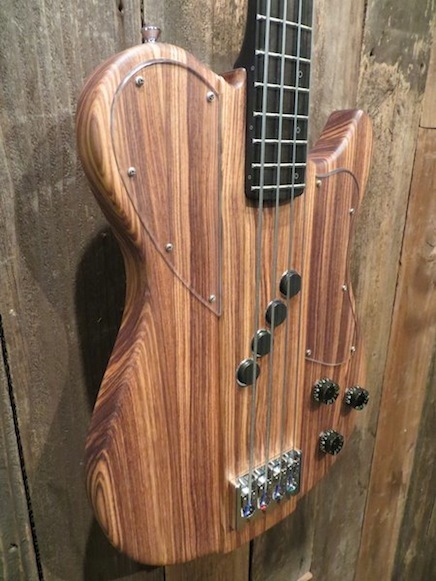 The basses are highly customizable with finishes, custom woodworking, and electronics. PS: NOT available in long scale! And then you have to marvel at the medium scale work of Teye. He started with a medium scale bass and decided later to add a long scale - you gotta love it. It's a shame there is such a small selection of medium scale basses available - but it is so great to see a glimmer of hope with these new Fender models. All I can say is - if you can find one - play one! It certainly made me a believer.